Vatika Coconut Oil – Indian Secret of Beautiful Hair – Natural coconut oils for hair! Ayurveda is not only a system of medicine, but also compendium of knowledge on nourishment and ingredients with beneficial influence on organism. Many Indian brands, like world famous Dabur, draw inspiration from secrets of ayurveda in process of cosmetic creation. One of those products is Vatika – intensive hair conditioner with natural coconut oil. Vatika cococnut oil – what will we find in the composition? Vatika intensive hair conditioner is concentrated coconut oil formula enriched with, i.a. Neem leaves extract, Brahmi, extracts of Amla, henna, milk, rosemary oil, lemon oil and of course fragrances. 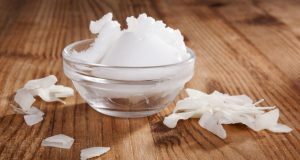 Each of ingredients is responsible for something else and in a different way supports properties of coconut oil on hair. Vatika coconut oil – how does it work? 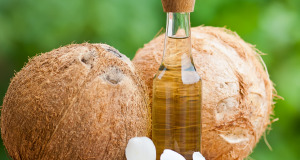 Dabur ensures that coconut oil properties in Vatika conditioner is in the foreground, that is why oil is great in regeneration and nourishment of high porosity hair, which are heavily damaged. It improves blood supply in the roots by stimulation of micro-circulation in skin, and that influences hair growth and prevents hair loss. Vatika with coconut oil strengthens hair, provides them with healthy gloss and velvety softness. Vatika coconut oil – how to use it? Vatika conditioner can be easily used as a conditioner on the entire hair or only for the ends. Small amount of the product can be applied on the ends without rinsing, but Vatika with creamy coconut oil applied on the entire length of hair requires rinsing. 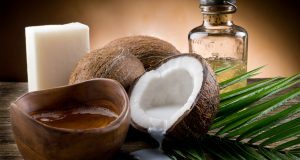 Properties of the coconut oil make it absorb deep in to the hair structure and provide deep nourishment, better than any other oil. Vatika coconut oil – where to buy? Contrary to the appearances, Dabur products are easy to obtain and not that expensive. That is probably the case because price of coconut oil isn’t high, and so final product won’t be expensive either. Sometimes we wonder where to buy coconut oil and it turns out that there is very little checked places. It is similar with Vatika conditioner – it is best to buy it from the vendors, which have good opinion on the product and great client service.